- The moon is rising, and night winds are stirring the leaves at your feet. You pause for only a moment, to clasp your Silver Crescent Raven Pendant about your neck, and then you swirl your cloak about your shoulders, and disappear into the darkness. If you are looking for a pentacle pendant that is packed with symbolism and power, you won't find a better choice than this. Even Paul Borda, the artist who created this original design, admitted that he loves this piece. And Paul is usually his own worst critic! 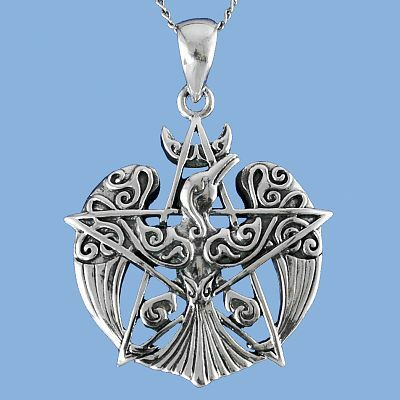 The Celtic raven at this heart of this pendant is interwoven into the arms of the five-point star, and his powerful wings sweep downward to suggest the outline of a pentacle, crowned with a crescent moon. The Raven, is a symbol of power, fate and transformation. The Crescent represents flow and change, the moon waxing and waning in the night sky. With the points up, it is known as the Horned Moon and is seen as the balance of masculine and feminine forces. Even the Celtic spirals that adorn the raven and the moon indicate the pure energy and strength of this extraordinary piece. It is up to you to build and focus this energy as you wish. Copyrighted design by artist Paul Borda. 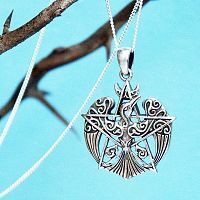 How big is the Silver Crescent Raven Pendant? This sterling silver pendant is 1" tall, including bail. It comes with an 18" chain. 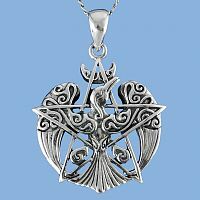 What Celtic deities are associated with the Raven? The Celts believed that ravens were messengers between the realm of mortals and the Otherworld, or world of spirits. Ravens and crows appear in countless Celtic legends and tales, but there are certain deities that have a particularly strong connection to these extraordinary birds. The goddess Morrigan often took the form of a raven. She gave strength to warriors in battle, but her appearance could also foretell of death or doom on the battlefield. Bran ap Llyr, or Bran the Blessed, was a Welsh king, and god of prophecy. In Welsh mythology, he is also called Bendigeidfran, meaning "Holy Raven" or "Blessed Crow". And finally, the sun god, Lugh (Lleu, Llew) counted the raven as one of his special animal companions. What's so special about ravens? Aside from their rich tradition in mythology and symbolism, ravens are fascinating birds in their own right. They are highly intelligent birds. They can use logic and reasoning to solve puzzles, and often use tools to accomplish their goals. They are also playful, and seem to have a wicked sense of humor, hence their reputation as a trickster spirit. Do you have any other questions about our Silver Crescent Raven Pendant?